Brown ground beef and onion; drain. 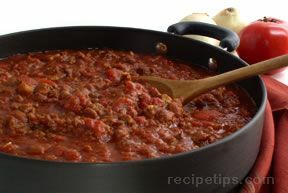 In large pot combine ground beef with the remaining ingredients. Add water until desired thickness. 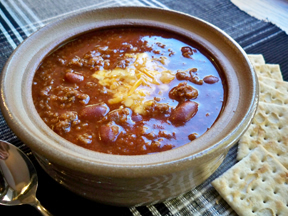 Simmer on medium-low heat to combine flavors. Add chili powder to taste. Add a couple of drops of Tabasco sauce to give it a little extra kick, if desired. TIP: Make a double or triple batch and freeze some for another day.